Kate Woodson's life is not what she expected. Once being a very active and lively woman, she now is a victim of her own body. Happiness is a thing of the past, however Andrew believes they can find some form of it in Maine, where a lake-house becomes available for the summer. The married couple thus set off, eager and full of hope, desiring the serenity of nature. Nature has other plans, however, as something resides within the dark, and it seeks their undivided attention. I received this book in exchange for an honest review. I thank Flame Tree Press for giving me the opportunity. I couldn’t help but notice the high amount of praise from the horror community regarding this particular Shea novel, so I was quick to jump aboard that train and request it myself. What immediately became apparent was how disturbed I felt right from the get-go, but not in the typical sense that relates to the genre. Rather, it was the very real and disquieting portrayal of Kate that provoked such a response. To have such a chronically ill main character was almost a shock to the system; I can’t say I’ve witnessed something to that extent during my travels into the dark. Her every waking moment was a challenge, and I couldn’t help but feel that this was, potentially, a very personal topic for the author - it was the in-depth, almost intimate account of Kate’s suffering. Upon reaching the end, I discovered I was correct, in that autoimmune diseases are a very familiar antagonist in Shea's life. No wonder the writing held such passion. First and foremost, let me state that the plot put an incredible amount of emphasis on the relationship between Andrew and Kate, which very much included the hardships and struggles that frequented their day to day life. I was warmed by their tenacious bond - something most of us yearn for, yet their marriage wasn’t without its share of problems. The painfully realistic and unwanted thoughts that often plagued their minds were a relatable aspect that only padded out their already authentic depiction. It was fairly easy early on to discern just how dependable this book was on characterisation and atmosphere; the first fifty percent was rather uneventful in terms of monsters and gore. I’m not saying there’s no horror, because there was a great deal of it, but some of it required a deeper look into what was presented. As for the creature itself when it came into play, well, it certainly got my mind theorising as to what exactly it was and its origins. At first I believed it to be something typical, but I was surprised to discover it wasn't as obvious as I initially assumed. I favour a good, creative approach to any plot, and this was no different. 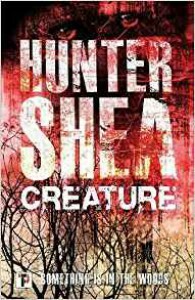 This being my first experience with Shea's work, I was thrilled by the reckless abandon in which he penned his violence. There's something special about carnage that has no boundaries in terms of who's going to end up as a corpse, and I felt that spark of excitement whilst anticipating the brutality that would come next. It was worth it - to follow these very real individuals into chaos. I can honestly say that this proved to be great read, and it nearly reached five stars. My hesitation however lies in the ending and my lack of emotion at what ultimately transpired. By the life of me I can’t explain why I didn’t feel much of anything, but I do massively rely on my feelings to dictate the final outcome. It's a shame, considering my attachment up until that point. Perhaps I found it too abrupt; the fate of those that survived probably would have proved more satisfying. In conclusion: I became quickly engrossed in this undeniably character-driven tale. I felt connected to the characters and their relationship, and it was as if I was a member of their family. The straight-forward prose was able to convey the harshness of their reality, which induced a lot of emotion within me. It was the ending that I became detached, but in the scheme of things it mattered little when I thoroughly enjoyed the journey to get there. Oh, and Buttons was a hero. Andrew grabbed the doorknob and was about to twist it when he stopped, suddenly unsure. He took a deep, steadying breath and tried again, heart thudding, skin crawling, at war with himself but knowing deep down he had to see. More than anything, he had to see what was out there. Share book reviews and ratings with Red, and even join a book club on Goodreads.